Dover, DE — A pair of long shots in This Is The Plan and The Downtown Bus stole the show in the $193,750 Matron Stakes for 3-year-old pacing colts and geldings on Thursday (Nov. 15) at Dover Downs, tag-teaming in deep stretch to nose out Jimmy Freight in a 1:49.1 dead heat. While Jimmy Freight and local favorite Lather Up tasted defeat in their Matron split, divisional standouts Six Pack and Youaremycandygirl refused to disappoint in their respective events. Six Pack rebounds from sickness to score at Dover Downs. Fotowon photo. In a meeting of the millionaires, dual classic winner Six Pack ($3.00) made easy work of the first-over Met’s Hall en route to a 1:54.1 score over sloppy going in his Matron Stakes division. 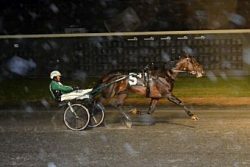 Trainer-driver Åke Svanstedt sent the son of Muscle Mass to the front immediately from post five, and the pair floated clear of Fashionwoodchopper (Yannick Gingras) midway on the first turn before rating early splits of :28.1 and :57.3. Up the backstretch, Met’s Hall (Andy Miller) sustained a first-over ascent out of third to within half a length of the lead, but Six Pack shrugged off his rival under minimal hand urging through the final turn. With Met’s Hall no longer a threat past three-quarters in 1:26, Six Pack accelerated away from Fashionwoodchopper to take his 15th career win by four lengths. Mississippi Storm (Andy McCarthy) saved ground after gapping cover to just collar the weakening Met’s Hall for third. Svanstedt co-owns Six Pack with Little E LLC, Stall Kalmar FF, and Lars Berg. Indiana standout Custom Cantab ($17.80) had something left in the stretch after winning a cutthroat first-quarter duel, as she was able to turn aside Plunge Blue Chip not once, but twice en route to a 1:53.1 Matron score. David Miller put the Mr Cantab filly in play from the outset, but the pair faced immediate resistance from Supergirl Riley (Tony Morgan) on approach to the first turn. After pressing in the two-path through a :26.4 first quarter, Custom Cantab accelerated to the fore with a circuit to go, but shortly thereafter faced pressure from the emerging Plunge Blue Chip (Åke Svanstedt) nearing a :55.2 half. Custom Cantab asserted up the backstretch, but had to dig in again a quarter from home to fend off the resurgent Plunge Blue Chip a second time on the final turn. Not only did she have enough to parry her outside rival, but she also kept a second push from Supergirl Riley — who emerged up the open stretch in the final sixteenth — a head short. Plunge Blue Chip’s third-place finish, 1-3/4 lengths behind, was enough to push her past the million-dollar mark in career earnings, while Breeders Crown winner Lily Stride (Tim Tetrick) failed to threaten from second-over and finished last. Trainer Chris Beaver co-owns 15-time winner Custom Cantab with Donald Robinson and RBH Ventures Inc.
Youaremycandygirl ($2.40) strode strongly to the front and never looked back, avenging Breeders Crown defeat to stablemate Percy Bluechip with a 1:51.3 win in their Matron event. Entering off a resounding 9-3/4 length win in the $113,000 USS Indy at Hoosier Park, Youaremycandygirl and driver Yannick Gingras out-sprinted Percy Bluechip (Matt Kakaley) and Solitary (Andy Miller) through a :27.2 first quarter before pulling the pace back. With a circuit to go, Dance Blue (Andy McCarthy) commenced a first-over bid from fifth and advanced steadily as the pace slackened through a :56.2 half. Up the backstretch, Youaremycandygirl’s lead was cut to a length and a quarter by Dance Blue, but was never in jeopardy. The daughter of American Ideal coasted through a :27.1 third quarter to evade Dance Blue and kept the pocket-sitting Percy Bluechip 1-1/4 lengths at bay in 1:51.3. Alexa’s Power (Tim Tetrick) chased evenly for third after being hemmed in until the top of the stretch. Ron Burke trains 18-time winner Youaremycandygirl for William Donovan. After Ontario standout Jimmy Freight was tasked with the heavy lifting through strenuous fractions and sternly dismissed the challenge of 4-5 local favorite Lather Up, This Is The Plan ($17.00, Tim Tetrick) and The Downtown Bus ($20.60, Corey Callahan) emerged in the final stride to simultaneously nose out Jimmy Freight in a dead heat in the glamour boys’ division of the Matron. Jimmy Freight and driver Scott Zeron let This Is The Plan clear before taking charge midway on the first turn and reeling off a :25.3 initial quarter. A determined advance from Lather Up (Montrell Teague) out of fourth with a circuit to go kept the pace hot through a :54.4 half, but Jimmy Freight remained undeterred with three-eighths to go and shrugged off that rival. Meanwhile, This Is The Plan remained close from the pocket and The Downtown Bus followed the three-wide cover of Breeders Crown winner Dorsoduro Hanover (Matt Kakaley) past three-quarters in 1:22.1. Turning for home, Dorsoduro Hanover stalled and Jimmy Freight was driven out to maintain a two-length lead, but it began to shrink in the final sixteenth. This Is The Plan lunged up the open stretch and The Downtown Bus surged widest of all, and they both reached the winning post simultaneously in 1:49.1, a nose better than Jimmy Freight. Dorsoduro Hanover found more in the stretch, but missed by a neck to finish fourth. Ron Burke trains This Is The Plan, a six-time winner by Somebeachsomewhere, for Burke Racing Stable, Weaver Bruscemi, Silva Purnel & Libby, and Larry Karr. Trainer Jeff Gillis co-owns 11-time winner The Downtown Bus with Ellen Ott.